When my family and I visit the local public library to scope out books, we like to look through the newest books first, and lately this has been the collection from which we make our picks. Book sourcing in this way is very interesting, as it usually leaves us walking up to the check-out counter with books ranging in subject matter anywhere from permaculture to the politics of race and class. We typically do not discriminate when choosing from the "new books" shelves, and as such, my man recently finished up a seemingly thousand-page book about the life and times of Kanye West--not written by the man himself. At this point, the both of us have far more information about this person than I'm sure we'd ever hoped to! 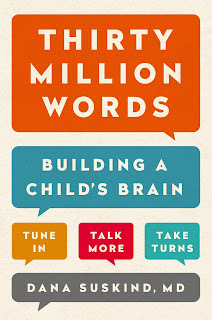 One book that I recently picked up from those same shelves is entitled Thirty Million Words: Building a Child's Brain, written by Dana Suskind, MD. I was instantly attracted to this book. Something that I've really been tuned into lately are the ways in which my daughter is learning language and meaning. It's pretty amazing to witness her grasp of words, ideas, and concepts, and at nearly 16-months-old (at least when I started this post, remember), she seems to be understanding it all exceptionally well and fast. This isn't coming from a place of vanity just because she is my child. I'm mostly just in awe and am grateful for the opportunity to witness how she "gets" what is presented--consciously or not--to her. It truly is something to behold. Those who've had the opportunity to witness it for themselves and who have really paid attention could likely attest to what I'm saying. 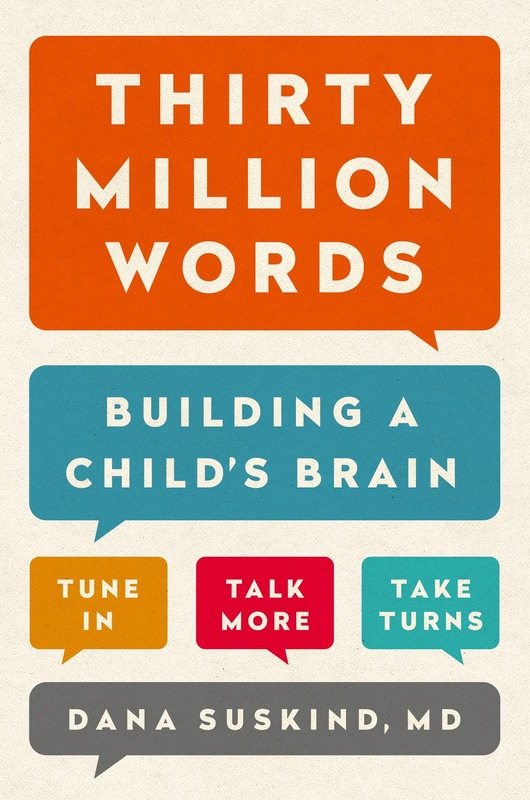 I began to understand, thanks to the work of many dedicated scientists, that it takes more than the ability to hear sounds for language to develop; it is learning that the sounds have meaning that is critical. And for that, a young child must live in a world rich with words and words and words. This book goes into detail about studies done and theories proved, and while it really all is useful information, it seems to all come down to what's said above. The understanding of words, phrases, and concepts from an early age--from what I've seen in my own child--has a lot to do with exposure. Just from being in the presence of people who talk and converse about different subject matter on a regular basis, and, as a result of having so many things pointed out and explained to her, Noni has a serious grasp on words and concepts. I don't think it's extraordinary as much as I see it being a testament to the power of the mind and the capacity for learning in humans. One example that I noticed immediately is when she started referencing herself as "I". Some phrases that she uses often are "I see", "I need", "I want", and "I don't want". What fascinates me is that we never consciously taught her anything about the pronoun 'I'. Yet, if I point at an airplane (a word that she says very well, by the way) and ask, "You see?" she responds by saying, "I see". (Adding about ten more of the letter 'e' to the word would be more reflective of what she really says.) How a child who's just learning to talk knows to say "I see" when questioned in that way is beyond me. I can only attribute it to her paying attention to how her father and I use language. Now. While she does have a vast vocabulary and is developing impressively in the language department, a person who's in our presence and tries talking to her may not hear a single word from her mouth. Instead, she has this thing of trying to divert their attention away from her by pointing at a random object and making a sound out of her throat indicating to them that they should look that way. It's pretty peculiar. You wanna know the word that's probably her favorite to say??? Wow!This book is truly eye opening and you hit all the valid points that I can relate to.